To shear sheep today, many sheep farmers use electric shears. But before electric shears were invented, they used hand shears. Hand-shearing is common in areas where electricity is limited. A hand-sheared sheep will produce more wool than an electric-sheared sheep. Hand-shearing is not an easy task; it takes practice to ensure the task is completely safe and minimally stressful to the sheep. Wash the sheep thoroughly, removing any debris that may get in the way. Pick out the larger chunks. Hold the sheep's mouth closed with your hand under the jaw and around the nose. Stand over the sheep and position him so that his bum is on the ground and his back is against your legs. The sheep will naturally slump into a concave position, belly up. Trim any discolored hairs on the sheep's belly by the scrotum or udders. Pull taught as your shear; the belly area is sensitive. Shearing the belly first will make the rest of the process easier. It will take up to three clips of the shears to clear the belly. Hold one hind leg and, with one or two clips, trim the inside of the back legs. Roll the sheep slightly to shear the outside of the legs and tail. Three clips on each leg and three on the tail will shear it. Shear the topknot wool on the back of the sheep's neck in one or two cuts. Open the fleece at the neck with one or two cuts to clear around the ears and behind the head. Shear the shoulder, the leg and as high as the shoulder blade goes. 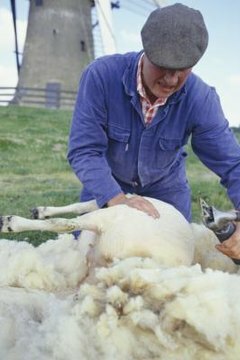 Lay the sheep down and shear over the shoulders in long cuts up the hips toward the neck. Start at the hip and go up the neck. Keep working up the backbone. Clear up the top of the face and work down the neck, rolling the sheep as you go. Shear down the neck, off the shoulder and off the leg. Bring the head up and continue down the body and out the leg. Clear off whatever is left over the bum and you're done.  Hand-shearing is less stressful for the sheep because hand-shearing doesn't buzz from an electric blade.  Hand-shearing sheep doesn't remove all the hair, leaving wool to provide an adjustment period for the sheep; using an electric blade removes the wool down to the skin. ⚠ Unless you are an experienced sheep shearer, you may need an additional person to help hold and control the sheep while you shear it. If you've never taken part in shearing, don't attempt to do so. Serve as an assistant to an experienced shearer first.